_Cashmere producers and enthusiasts from across the continent were delighted to participate in a Cashmere Classification Workshop led by Dr. Joe David Ross of Sonora Texas, at Fibre Week 2010. The purpose of this video is to share salient points of cashmere classification from that workshop with a broader audience. I attended the Classification Workshop with Dr. Joe David Ross in 2010. As part of the participation I got to make my own workbook with identical fibre and evaluation to the workbook made available by the CCPA. This workbook has proved invaluable while evaluating my fleece herd. It is so handy to pull out "good crimp" and "average crimp" samples or "super fine micron" and "fine micron" samples as graded by Dr. Ross to compare to my own fleece samples. It's like having a cashmere expert guide my herd evaluation and decisions. If you weren't able to attend the workshop the video would also be invaluable in answering your questions like "This doe is fine but lacking a bit of crimp....now what?" As a relatively new producer I am so thankful that the CCPA made the workshop possible and made the DVD and Workbook available so other producers can benefit too. 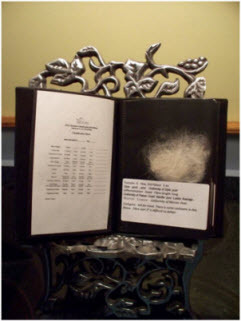 _ The Tactile Workbook is a compilation of fleeces that were classified during the Cashmere Classification Workshop with Joe David Ross, at Fibre Week 2010. This workbook is a tactile resource to be used as a comparative reference when assessing and classifying cashmere fibre. It includes a classification sheet and samples of the fleeces examined in the workshop, with classification results for each. 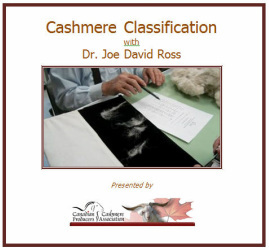 Fibre samples in the workbook are cross referenced with specific fleeces examined in the Cashmere Classification Workshop DVD. Limited Quantities. We loved our first one so much we have decided to buy another and just want to let you all know this is a fantastic tool.